How do I know if the 4G broadband will overload my Freeview? During 2013, some of the frequencies that were used for television before the Digital Switchover will be auctioned off and used to provide 4th generation (4G) mobile broadband. Many homes will need to fit a filter, and a small few will have to switch (for free) to Freesat. Knowing in advance where these homes are is a complicated matter. Back in June 2011, we looked at how Ofcom moves to protect Freeview interference from 4G mobile . Since then, the television Digital Switchover has been finished and 4th generation (4G) mobile broadband services - also known as Long Term Evoluition (LTE) have launched all over the world, including a service from Everything Everywhere (EE) in the UK. To understand why and how these 4G broadband services will cause problems during 2013, you need to take into consideration a number of technical factors. The Radio spectrum is the name given to the frequencies of the electromagnetic spectrum that can be usefully used to transmit radio, television and data services. The top bar on the diagram below (or download) shows a selection of the services used in the UK, with old-fashioned long-wave radio, then medium-wave radio, though FM radio, the digital DAB radio services up to those used for television broadcasting. (See here for a really complex chart). The highest frequencies on the diagram, the "ultra high frequencies" (or UHF) band is shown enlarged as the lower purple bar. In this range we can see TV "channels C21 to C60" (blue), second- and third- generation mobile phones (2G orange, 3G pink) and the location for the 4G services. It is important to note that some of the 2G capacity in the "1800MHz" range has already been converted to 4G operation by Everything Everywhere (EE). The other two yellow boxes show the "800MHz" (to the left) "2.6GHz" (on the right). 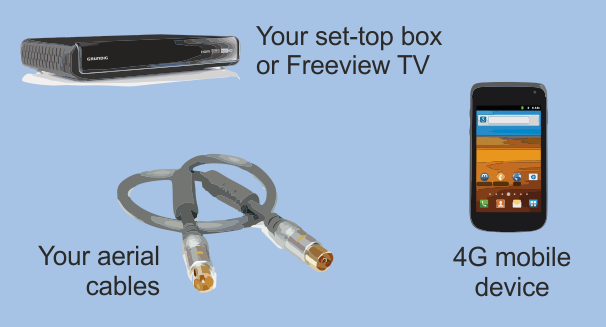 For the purpose of Freeview reception, only the 800MHz range need be considered. The other two ranges will not cause Freeview problems. As we have seen already - Freeview signals: too much of a good thing is bad for you - Freeview boxes are designed to protect themselves against signal overloads. When they do this they close down and people often incorrectly diagnose the problem as being "no signal" when there is too much. The problem that has to be solved as the 4G services launch, is that the new mobile broadband signals can cause overloads onto the frequencies that are being used for Freeview. One particular problem is that a very common type of Freeview signal decoder, a superheterodyne receivers are sensitive to signals being present nine channels (72MHz) away. In addition to overloads, 4G may also cause Signal-Interference Noise Ratio degradation, where reception breaks down because the receiver can no longer decode the digital information in the transmission. Using the 'Sitefinder' Mobile Phone Base Station Database you can compare the locations of existing mobile phone "masts" with those used for Freeview Transmitters. Here is an example from Brighton and Hove, where a medium-sized single mast (Whitehawk Hill) can cover a whole city, but where hundreds of mobile phone base-stations cover a many smaller-by-comparison areas. This illustrates two points. Firstly, that Freeview broadcasts are high powered and one-to-many - mobile devices are low power and peer-to-peer. The mast your TV signal comes from may be miles, sometimes tens or miles away, for your mobile perhaps only meters away. The second point is that if an existing 2G/3G mobile supplier wins a 800MHz 4G slot, they will wish to use their existing "phone mast" locations (especially the 900MHz ones) as this would be most economical for them. Until the action winners emerge, and then plan their network, only idle speculation about possible interference can be made. Research (see here) shows that a 4G mast in relative close proximity, or a mobile 4G handset closer than a meter to an unfiltered Freeview box will cause overloading on many tested devices. The following diagram shows the relationship between the 4G use and the old TV channel designations. Those Freeview transmitters that use channels above C52 are most likely to have receivers that get overloaded by the use of 4G signals in the 800MHz area. FDD is Frequency-division duplexing - the transmitter and receiver operate at different carrier frequencies. Once the proposed mast locations for 4G services are known, it will then be possible to predict which homes will need to fit the special filters in areas where Freeview uses the higher channel numbers (the C52 to C60 range). 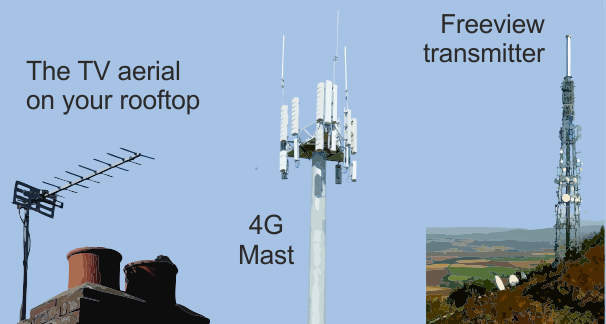 If you then have a rooftop aerial without a signal amplifier, to get an overload you will need the 4G mast to be in the line-of-sight between your Freeview transmitter and the aerial, or possibly "directly behind" the aerial. If you then have a rooftop aerial and an amplifier, or perhaps have lower-grade cables, you are likely to need to protect from a 4G overload if the phone mast is close to your rooftop aerial. Some powerful transmitters and many relays use the high frequencies: Sudbury, Oxford, Belmont, Winter Hill, Tacolneston, Pontop Pike, Mendip, Emley Moor, Clermont Carn, Truskmore and Maghera. C52 is used by 81 transmitters - including Emley Moor, Sandy Heath, Clermont Carn and Mendip. Again in areas where Freeview uses the higher channel numbers (C52 and above) you may have to protect your Freeview devices from signals from a 4G handset (such as mobile phone, tablet, or USB "dongle"). This may, once again, require the fitting of a special filter, or the upgrading of the "fly leads" used to connect your aerial to the set top box or TV. This may be a particular problem if you have used an indoor aerial or signal amplifier. John: "PSME" = "programme making and special events", which are basically radio mic systems. I am very sure that short range transmitter devices are NOT licenced to use 868MHz. We have a digital TV which until last week got all the Freeview channels. Now many of these channels are no longer available. ITV1, Channel 4, Channel 5 etc are now no longer recognised channels on our TV. How can we get these channels back? Adrian Preston- More info is needed, where are you? what is your postcode? do you know which transmitter you use? Adrian Preston: Plus in addition to that already said by Ian from notts, and being, that provided you have not already done so then do NOT carry out a retune as the programmes will most likely return of their own accord, as certain Southern areas of the UK are presently suffering from severe levels of interference due to the atmospheric conditions prevailing at this time. If of course you have already carried out a retune then unfortunately this action will require to be repeated until you recover the missing programmes, but the info requested by Ian from notts is really essential in order to properly assess your situation. I live in Anerley, London SE20 and my channels on freeview have all just gone. The channel header shows when I press the channel change but no picture comes up and then the header dissapears too. This happened from Late this Friday. I am down the road from the Crystal Palace TV transmitters. Is this a 800mhz problem? During the last 3 months my tv signal has become impossible to use. The 4g people say I am not in a 4G area. I fitted an 800 MHz filter and there was an immediate improvement. On the advice of Sony I have upgraded my booster to 20 dB and my reception is near perfect. What has caused this unwarranted interference. My postcode is RG29 1PH and I M tuned to Hannington..
Viv Gunton, I would assume if a filter helped a problem over 3 months old? A rogue signal has appeared ? simply could be a CB aerial has been put up? or an extensive alarm system set up locally? If the advice from Sony to fit a 20db Amp to your system has work, I will assume you live in a poor signal area ? gilbert clark: If you actually have a 4G problem, then at800 will supply one for free. You should call them on 0808 13 13 800 to check if there is an active 4G mast in the vicinity.